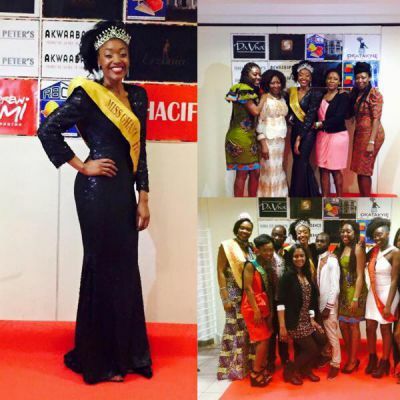 Miss Efya Owusu is Miss Ghana France 2015. Miss Efya Owusu, a 22 year old University Student of Conflans Sainte-Honorine in the Paris region, has been elected Miss Ghana France 2015. The 1st Dauphine is Jennifer Okyere, 22 years of Melun, Priscilla Enum, 17 years of Villetaneuse emerged 2nd Dauphine. Efya says she will use her title to facilitate the renovation of schools in villages of the Brong Ahafo Region of Ghana. Gold Coast Events wish to express sincere thanks to Diplomats of the Ghana Embassy, all Ghanaians, Ghanaian Community Chiefs/leaders and friends of Ghana who made it to Espace Venise at Sarcelles in the Paris Region for the 2015 edition of Miss Ghana France. Gold Coast Events is particularly grateful for the presence and speeches delivered by Nana Opuni Duah Ware 1 (2ATP-MR), Nana Ansah Sasraku, GhanaHene in France, Minister Counsellor Owusu Manu of Ghana Embassy in France Diaspora desk, Hon. Michael Osei Mensah( President of the Federation of Ghanaian Diaspora in Europe and the Ghanaian Community in France) and Nana Serwaa Frimpongmaa, President of Ghana Diaspora Fund. Special gratitudes go to the sponsors especially 2 ATP-MR.
Bravo to the contendants : Efya, Jennifer, Priscilla, Dora Osei Kwasi a 23 year old student of Les Mureaux , Aicha Alhassan a 22 year old student of Bordeaux and Francesca Marfo a 21 year old student of Toulouse. The Ghanaian Community appreciates your courage.You displayed both inner and outer Ghanaian beauty. The jury found it challenging to elect. D.J. Obed, the Silent DJ made it happen there. Lydia Osei Kwasi(Gold Coast Events) and Patrick Sarpong Dumorine(President of Gold Coast Events, Founder of ghanainfrance.com and Vice-President of GHACIF), Aline Adu, Darling Frimpong, and all members Gold Coast Events, made it happen.